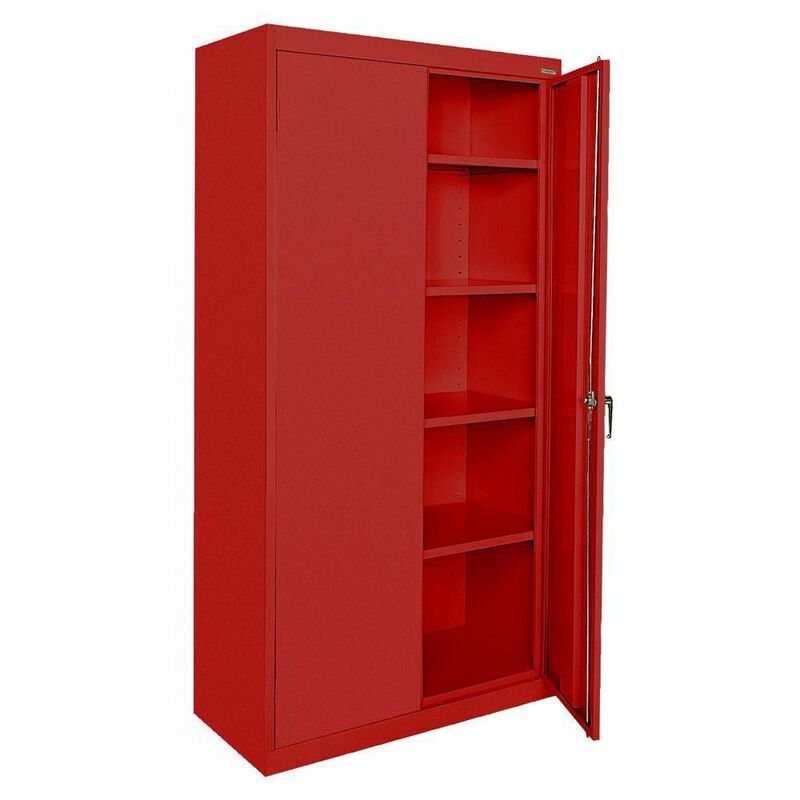 Classic Series 36 Inch W x 72 Inch H x 18 Inch D Storage Cabinet with Adjustable Shelves in Red Great for the office or warehouse, this Classic Series garage cabinet provides secure storage for office products and other essentials. Features include four fully adjustable shelves on 2-inch centres, plus a raised bottom shelf, a three point door lock system and three sets of hinges per door. Classic Series 36 Inch W x 72 Inch H x 18 Inch D Storage Cabinet with Adjustable Shelves in Red is rated 4.5 out of 5 by 10. Rated 5 out of 5 by Andrew from Nice, solid cabinet. Assembly was minimal and straightforward (handle).... Nice, solid cabinet. Assembly was minimal and straightforward (handle). Five shelves provide plenty of space, and they come with covers on the corners to minimize scrapes on the cabinet interior. Great customer service from Sandusky. Rated 5 out of 5 by Rod from Very impressed. Sturdy and good looking. No wobble... Very impressed. Sturdy and good looking. No wobble when you jerk on the doors. Plus lots of shelves. Rated 2 out of 5 by Kathryn from THE RODS CONNECTED TO THE HANDLE KEEPS FALLING OUT OF... THE RODS CONNECTED TO THE HANDLE KEEPS FALLING OUT OF THE TOP AND BOTTOM HOLES. KEEP HAVING TO STOP AND FIX IT. Rated 5 out of 5 by GrandpaC from It met our needs and expectations. We're very happy with our purchase. It met our needs and expectations. We're very happy with our purchase. Can casters be added to this cabinet?